Mount Ida also known as Idha, Ídhi, Idi and Psiloritis Ψηλορείτης sits at 2,456 m looking down over Kriti from the centre of the island. The range extends through Rethymnon and Iraklion prefectures in an east west direction. The name Ida seems to be derived from the ancient word for the mother goddess de or da. Thus, the goddess associated with Mt Ida is Rhea, the earth goddess and goddess of nature, animals, mountains and caves. She is often pictured with two lions at her feet. She is associated with bees, which are also a symbol of Crete from ancient times, as the island was known for its heavenly honey. Of course it still is today. 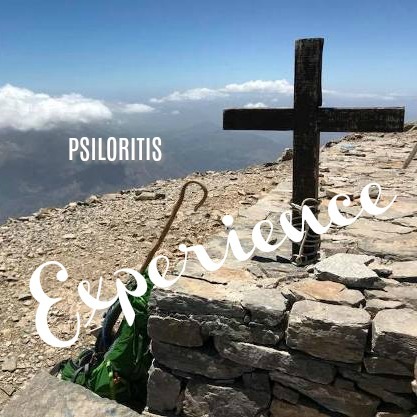 Psiloritis literally means “the tall one” and is a proud and affectionate name for the mountain which gives him a personality and instantly creates a relationship of awe and respect. Home of many mountain villages, such as Anogia, and plateaus such as the Nida Plateau. This range is also part of the E4 European walking path. The steep, inaccessible and wild mountains and gorges have characterised Crete and its people and turned the pages of history, as freedom fighters and foreign resistance supporters hid in her mountain villages and caves. The stories of the adartes, the freedom fighters, are woven into the personality of Crete. From ancient times, the shepherds of the mountains have played an important part of the culture of the island. The timeless image of the weather-beaten shepherd sitting amongst the rocks and thyme, singing softly to his sheep or goats, has been a symbol of freedom, co-mingled with hardship and isolation, a recurring theme in the Cretan and Greek story. Zeus Cave is in these mountains, it is known as Ideon Andron and sits looking over the Nida Plateau. This wide mouthed cave has an inner cavern where excavations have found jewellery, bronze shields, seal stones pottery and metal artifacts. These finds reveal the history of Crete, including sanctuaries of worship. Psiloritis Ψηλορείτης range is part of the European Geopark. Rare endemic species, an unusual ecology and geological formations under intense scrutiny by scientists, biologists, geologists and speleologists contribute to its value and distinction. Wildflowers of spring are famous in Kríti. There are walking tours arranged every season with knowledgeable botanists. 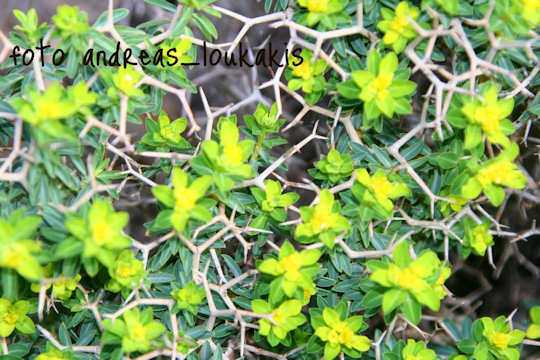 268 of Greece's endemic plants can be found in Crete, 196 are native only to Crete. On the mountain are 76 endemic species. Plants of the area include to wonderful aromatic herbs for which the island is famous; including thyme and dictamo. Dictamo also known as erontas is a strong herbal remedy. On the slopes are found hawthorn trees, kermes oak, Cretan maple trees and holm-oaks. Rouvas forest near Zarós has many kermes oaks and extremely rare Cretan orchid Cephanlanthera cucullata and rare tree Zelkova abelicea. Greek Spiny Spurge (above) is found amongst the rocky screes. Other caves to explore are Kamares, Sfendoni and Melidoni. Speleologists also study the cave-precipice of Tafkoura and the Labyrinth cave. Striking rock formations and hard hiking can be found in Zarós Gorge, Kamares Gorge and Vorizia Gorge. The mountain villages of Axós, an ancient Cretan site, Zonianá, Livádia and Garázo are typical traditional villages. 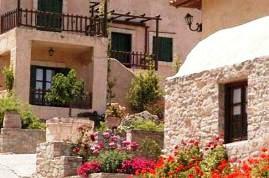 Perama and nearby Margarites are small mountain villages where you will find the natural products such as raki, cherries, honey, olive oil, and cheeses such as graviera, anthotyro and myzithra made from mountain milk. 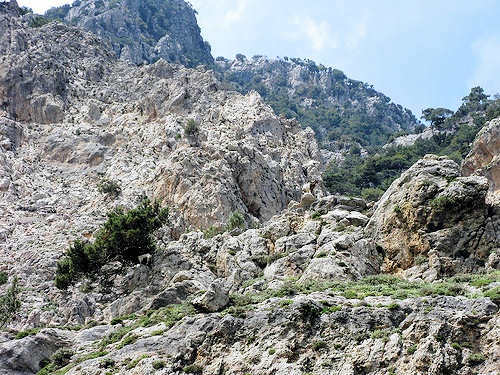 Climb with a Guide - contact Dromolatis, a knowledgeable and experienced mountain man of Crete, to enquire about hikes in the Psiloritis Range. See the pdf guides under the tab 'For the Visitors' - 'Tourist Guide' and under the tab 'Leaflets'. Hiking Nida Plateau and Psiloritis in October... we are planning hiking at the Nida Plateau and to the summit of Mount Ida in October. Which temperatures can we expect at day and night? 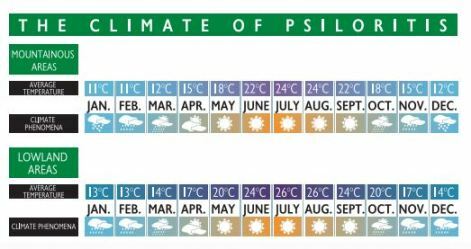 Below you can see the monthly average temperatures in celcius for the mountainous area of Psiloritis in Crete. 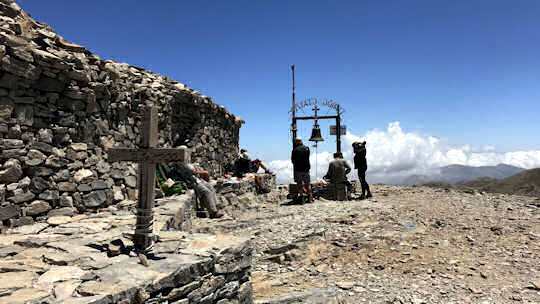 On September 14 every year, 'Timios Stavros' or 'Holy Cross' is celebrated, this is the small chapel on the very highest peak in Crete - Mt Ida. Many walk up to celebrate this special festival, and in recent years the walk/hike has become very popular. The official celebration is at dawn on the 14th, so the priest and many other walkers set out the day or night before, to get there for the dawn ceremony. Psiloritis Race - a mountain running event in the steps of Zeus - 35 km from Nida Plateau to the peak of Mt Ida - held in June. 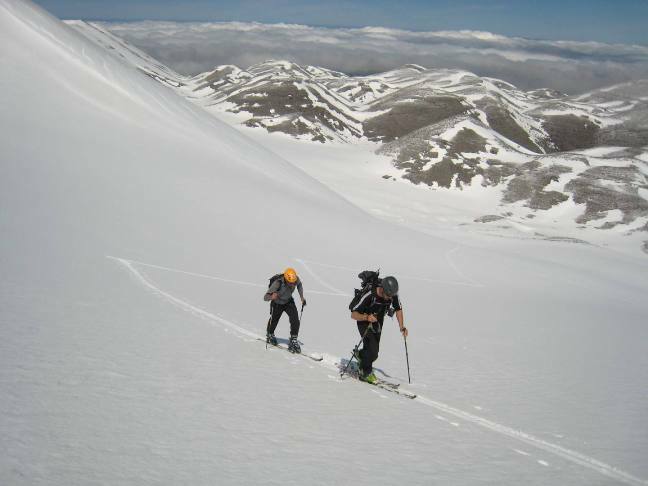 Pierra Creta - a mountain skiing event held in March - began in 2014, see the video below. Reaching the peak of Psiloritis - Mt Ida - at Timios Stavros Cross and small chapel - a lone skier enjoys the bright blue day. 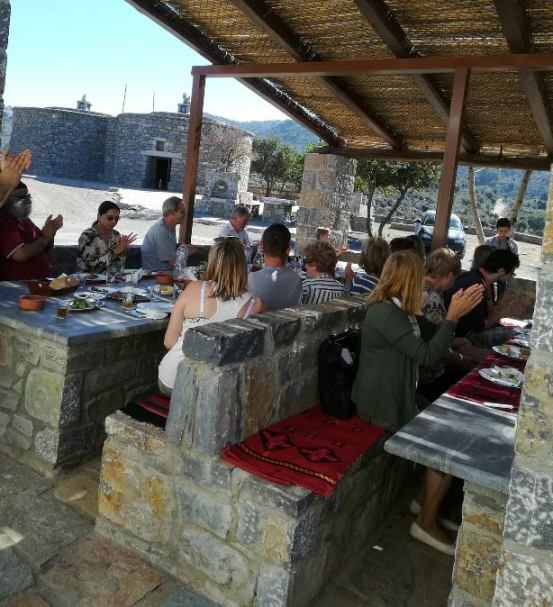 Enagron Traditional House will give you quality accommodation and an authentic Cretan experience, it is located near the village of Axos in the Psiloritis range. A stunning hidden gem in the fresh mountain air. Arodamos Guesthouse is located on the plateau of Livadi close to Nida Plateau in the foothills of Psiloritis. Visit in summer or winter for a complely rural escape. Eleni's Stately Home would be a wonderful base for a family who loves hiking to stay whilst exploring the Psiloritis range and Rethymnon in central Crete. Two families could gather here very comfortably, as the home welcomes 9 guests with 3 bedrooms, 3 bathrooms and a private pool. WARNING: If you plan to walk, hike,ski or explore caves on Psiloritis you must seek guidance and local knowledge. There are many climbing and walking clubs in Crete. 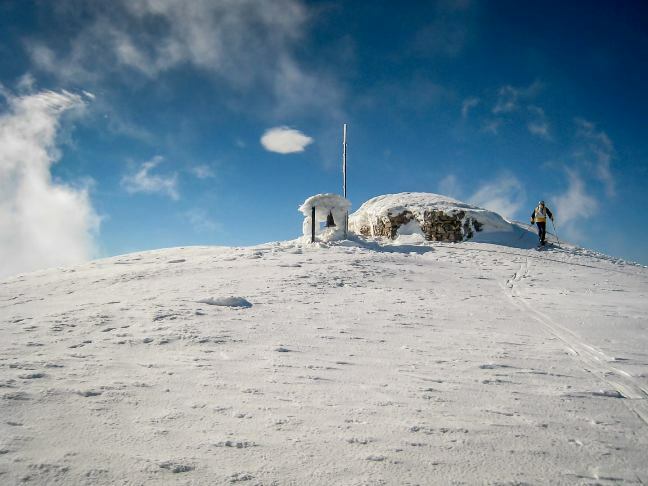 Beware of changing weather conditions and isolated, inaccessible areas. 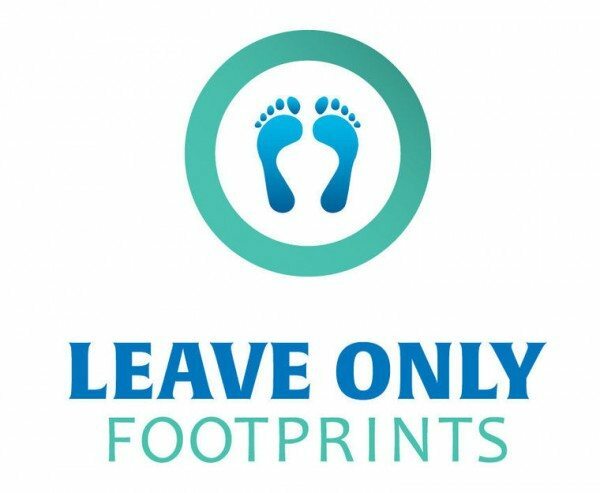 Please respect the ecology of this beautiful island. Below you will see the video of an experienced hiker, climber who reached the peak in snowy conditions in early December. 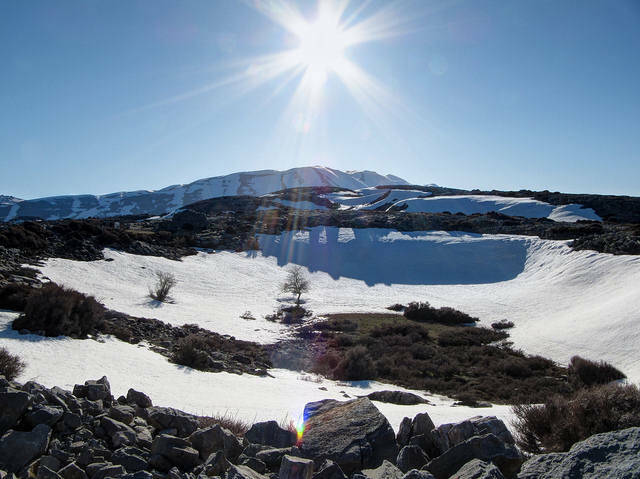 Here is a presentation of the Psiloritis Geopark highlighting the mountains in all seasons, watch for the shepherds huts or 'mitata' made of stones. 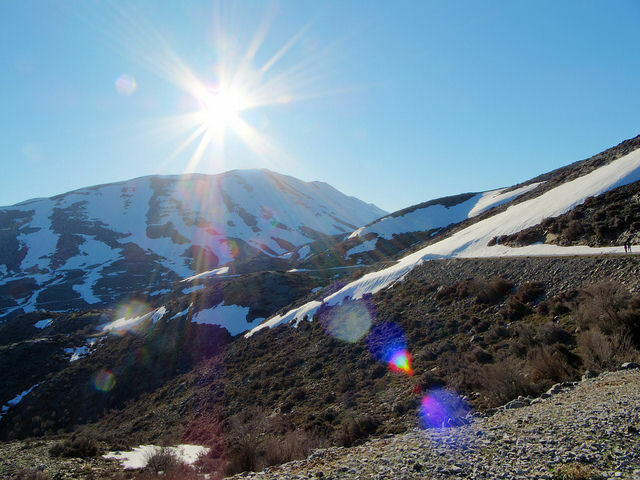 In this video you will see hikers starting from Mygero Refuge going up to Psiloritis peak and Timios Stavros chapel with extraordinary views from the summit. Below you will see highlights of the Psiloritis Race - a running competition held each year - taking in the magnificence of the landscape.